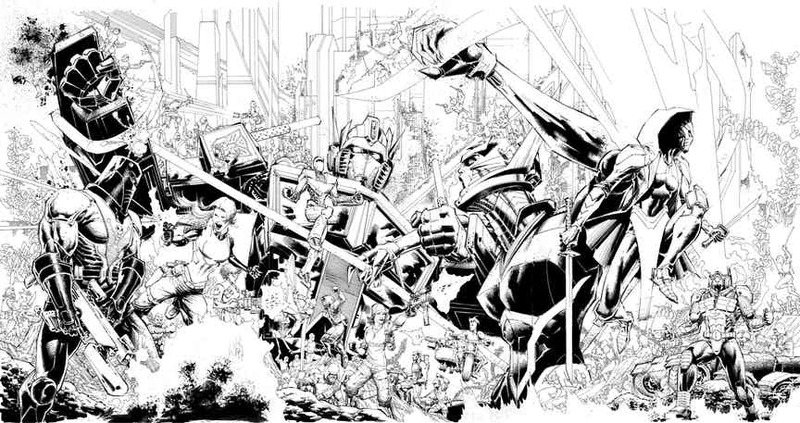 Thanks to CBR.com, we have a very impressive line-art of the next a IDW Crossover title: First Strike. Veteran comics artist and Image Comics co-founder Whilce Portacio illustrated a triptych cover that will be published as retailer incentive covers for issues #1, #3 and #5 of First Strike. The covers will be available to retailers who order 50 copies or more of each First Strike #1 and #2 (both scheduled for release in August). First Strike #1 is scheduled for release on Aug. 9, and will run for six issues in a twice-monthly shipping schedule.